This award is presented to recognize and to thank an individual or individuals for service to NASFAA or the profession. 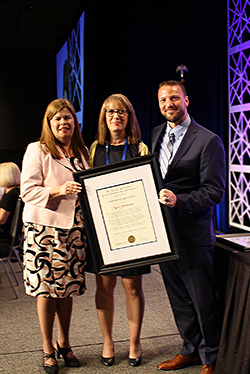 In order to receive this award, the recipient should have performed some service or made a contribution to NASFAA or the profession (either a single achievement or a lifetime of service). It can recognize people upon retirement or leaving the profession. Mary Sommers has made countless contributions to the financial aid profession for close to 30 years. She has served on NASFAA’s Board in multiple roles, headed up key task forces, and held leadership roles in her state association and RMASFAA. She is also a recipient of NASFAA’s Meritorious Achievement award in 2012. Since July 2015, Mary has served as NASFAA’s first Ethics Commission Chair – as such, she has effectively and conscientiously guided the thoughtful deliberations of the Commission as they worked to educate members with regard to their ethical responsibilities, enforce ethical conduct among financial aid administrators, sanction those who fall knowingly out of compliance with our Code of Conduct, and ensure that the reputation of our profession remains above reproach. Mary is principled, organized, purposeful, and compassionate. We thank her for her service to the NASFAA membership as Ethics Chair from 2015-2018.